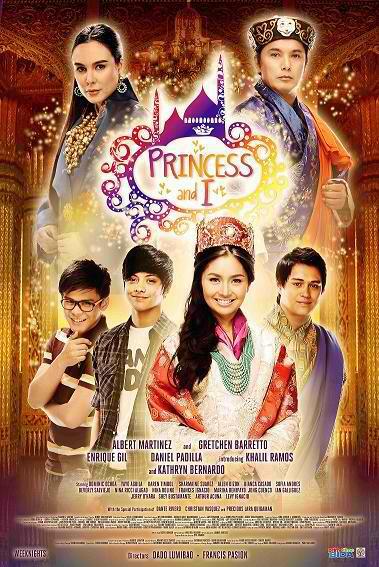 ABS-CBN's 'Princess and I', which stars Kathryn Bernardo, Daniel Padilla, Enrique Gil, Khalil Ramos and Gretchen Barretto, posted a high pilot ratings both in Mega Manila and Nationwide last Monday, April 16, 2012. Based on the Mega Manila People Ratings provided by AGB Nielsen to Pep.ph, 'Princess and I' pilot ratings last Monday was 11.6%. Though it failed to beat GMA 7's 'Biritera' which was shown on the same timeslot, the said pilot ratings of 'Princess and I' was already the 3rd highest ratings among primetime shows for that day, with 'Walang Hanggan' and 'Biritera' ranking 1st and 2nd respectively. Kantar Media's National Household Ratings meanwhile showed a much more impressive debut ratings for 'Princess and I' as it scored 31.7% versus 'Biritera' which had almost half of that, 16.7%. It ranked 2nd over-all, just behind 'Walang Hanggan'. When talkin' about the pilot ratings of all primetime teleseryes which made their debut this 2012, that of 'Princess and I' can be considered not so impressive in Mega Manila, but very impressive nationwide.